You can also download the entire All's Well That Ends Well translation as a PDF! HELENA, DIANA, and the Widow enter. That you may well perceive I have not wrong'd you, One of the greatest in the Christian world Shall be my surety; 'fore whose throne 'tis needful, Ere I can perfect mine intents, to kneel: Time was, I did him a desired office, Dear almost as his life; which gratitude Through flinty Tartar's bosom would peep forth, And answer, thanks: I duly am inform'd His grace is at Marseilles; to which place We have convenient convoy. You must know I am supposed dead: the army breaking, My husband hies him home; where, heaven aiding, And by the leave of my good lord the king, We'll be before our welcome. So you can be totally sure I haven't wronged you, one of the greatest men in the Christian world will speak for me. Before his throne, I will need to kneel before I can make everything clear. There was once a time I did a great service to him almost as dear as his life. Even if he was a violent Tartar, the gratitude for that deed would still overwhelm him and answer with thanks. I've been told that his grace is in Marseilles, and we have convenient means to get there. You must know that I am assumed dead. The army breaking up, my husband's hurrying home, where, with heaven's help, and with the king's support, we'll be there ahead of him. Gentle madam,You never had a servant to whose trustYour business was more welcome. Gentle madam, you never had a servant who trusted you more in whatever you say. Nor you, mistress, Ever a friend whose thoughts more truly labour To recompense your love: doubt not but heaven Hath brought me up to be your daughter's dower, As it hath fated her to be my motive And helper to a husband. But, O strange men! That can such sweet use make of what they hate, When saucy trusting of the cozen'd thoughts Defiles the pitchy night: so lust doth play With what it loathes for that which is away. But more of this hereafter. You, Diana, Under my poor instructions yet must suffer Something in my behalf. And you, mistress, have never had a friend who more desires to pay you back for your love. I'm confident that heaven has put me here to pay your daughter's dowry just as heaven has put her here to be my instrument and helper to win my husband. But, oh strange men! They can make such sweet use of the women they hate, even when they are giving into such lustful thoughts that defile the dark night. In that way, his lust has played with the thing it loathes instead of that thing which is absent. But more of this later. You, Diana, under my poor instructions still must suffer something on my behalf. Let death and honestyGo with your impositions, I am yoursUpon your will to suffer. Even if I had to give up death and chastity on your orders, I'll follow you in whatever you need me to undergo. Yet, I pray you: But with the word the time will bring on summer, When briers shall have leaves as well as thorns, And be as sweet as sharp. We must away; Our wagon is prepared, and time revives us: All's well that ends well; still the fine's the crown; Whate'er the course, the end is the renown. Not quite yet. But when it comes time for me to give the word, summer will arrive, and the roses will have leaves as well as thorns and be as sweet as they are sharp. We must get away. Our wagon is ready, and time is ticking. All's well that end's well. The conclusion is the crowning moment. Whatever the means, the end is what will be remembered. Rubins, Dan. "All's Well That Ends Well Translation." LitCharts. LitCharts LLC, 19 May 2017. Web. 25 Apr 2019. Rubins, Dan. "All's Well That Ends Well Translation." LitCharts LLC, May 19, 2017. 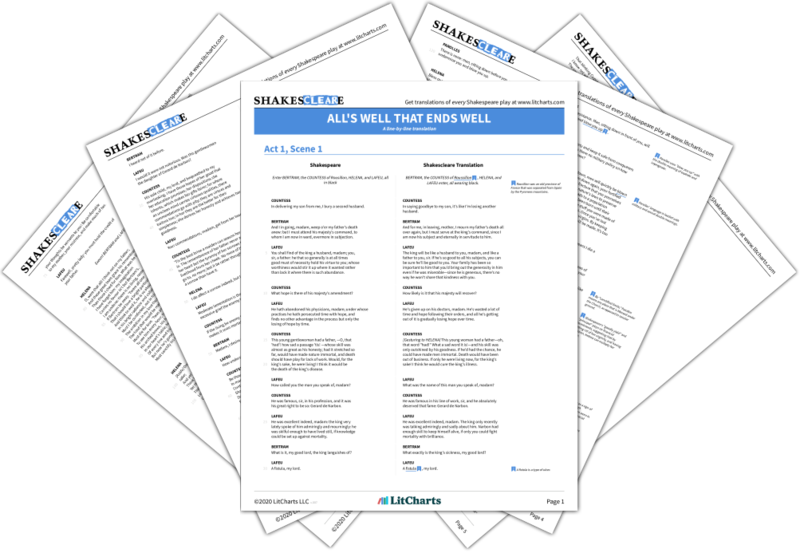 Retrieved April 25, 2019. https://www.litcharts.com/shakescleare/shakespeare-translations/all-s-well-that-ends-well. Join LitCharts A+ and get the entire All's Well Translation as a printable PDF. 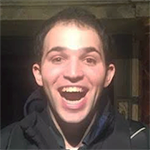 Dan Rubins is currently completing his MA in Shakespeare Studies from King's College London/Shakespeare's Globe and will be pursuing an MA in Elementary Inclusive Education from Teachers College, Columbia University. He holds a BA in English from Yale University. His Masters dissertation focuses on announcements of death in early modern drama, and other research areas of interest include Shakespeare in transformative contexts (prisons, schools, etc.) and rhyme in Shakespeare's dramatic texts. In addition to teaching and learning, he also writes theatre reviews (often of Shakespeare productions), composes musical theatre (frequently with Shakespearean inspirations), and sings in choirs (occasionally in Shakespearean choral settings).